Looking for a trustworthy interstate removals company in Melbourne? You have come to the right place. Now you don’t have to worry about moving your furniture anymore. We understand the hassles that come with relocating which is why we offer tailored services with budget interstate removals in Melbourne. Our team is highly professional and experienced when it comes in handling all your furniture with extreme care. For a first time mover, shifting can seem to be a rigorous task. We provide Cheap Interstate Removals so that you can sit back and relax while we take the load off your shoulders. Supercheap Interstate Removals have assisted thousands of families, couples and singles in relocating across Australia by offering not only cheap packaging and transportation of all goods and furniture but also ensuring unscathed delivery. For secure interstate furniture removalists in Melbourne, we provide seamless door-to-door removing facilities with reliable transportation and on-time delivery. Being one of the cheap interstate movers in Melbourne, we don’t just move your furniture but we take extreme care and caution while handling it. We cater to varied segments of clients having different requirements and priorities. Supercheap Interstate Removals does its best to accommodate them and provide the best possible service for interstate furniture transport in Melbourne. We, at Supercheap interstate removals, realise the personal value each and every artefact holds which is why we make it our duty to keep your goods and furniture guarded and undamaged. Our exceptional team is well- trained in all relocating services and provide best-customized packages at affordable rates. Interstate furniture transport in Melbourne has never been this easy! Supercheap Interstate Removals is here to take the load off you. We offer highly skilled packagers equipped with various packaging facilities for securely packaging and transporting your goods from one place to another. Our highly experienced and professional movers ensure fast and safe delivery. Our vehicles have strong and sturdy containers with reinforced safety protections in place and are equipped with the latest security systems to ensure your furniture’s safety. Pick from any of the removal services below or contact us directly to know about the awesome service we provide. Are you relocating to the beautiful coastline of Sydney from Melbourne? 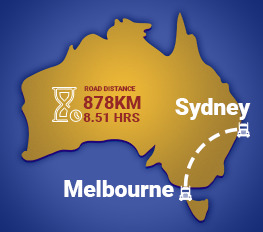 For such interstate furniture removal services, we can deliver your goods to Sydney in no more than a day! 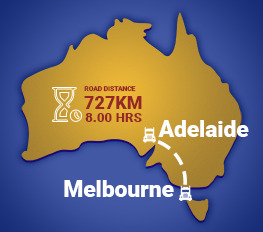 If you are moving from Melbourne to the cosmopolitan city of Adelaide, we can assist you in shifting your whole home safe and sound to Adelaide in a day within your budget. Do you want removalists to help you move to Brisbane? 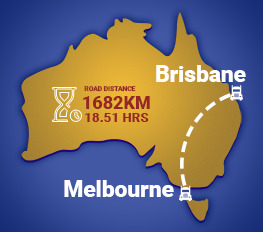 We have got you covered with excellent packaging and quick deliveries to Brisbane from Melbourne. 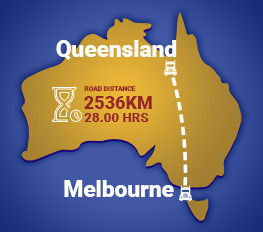 For interstate furniture removal services from Melbourne to Queensland, we offer unparallel long distance delivery by road at affordable rates in the shortest time possible. We, at Supercheap Interstate Removals in Melbourne, offer the comprehensive package at competitive prices customized to match your requirements. We handle your furniture with the utmost care and make sure that it is delivered without any fuss quickly. You can depend on us to get your furniture intact across to your preferred location. With our secure transportation facilities for furniture, you can be assured that all the furniture and goods will be safely guarded. We follow the golden rule- ‘When the Customer Comes First, The Customer will last’ We do everything in our ability to guide and assist you in your relocation process. We provide unparalleled customer service that guides you through the entire process and keeps you in the loop 24/7. It's an uphill task to find the rare combination of quality and affordability. But with Supercheap, we combine not only that but add in efficiency and safety in a single package and present you with high-quality services that are worth every penny you spend.